This work presents a protocol for manufacture sodium tungstate and sodium molybdate microcapsules via bacteria and their corresponding nanoparticles. Lin, P. H., Huang, Y. T., Lin, F. W. Synthesizing Sodium Tungstate and Sodium Molybdate Microcapsules via Bacterial Mineral Excretion. J. Vis. Exp. (131), e57022, doi:10.3791/57022 (2018). 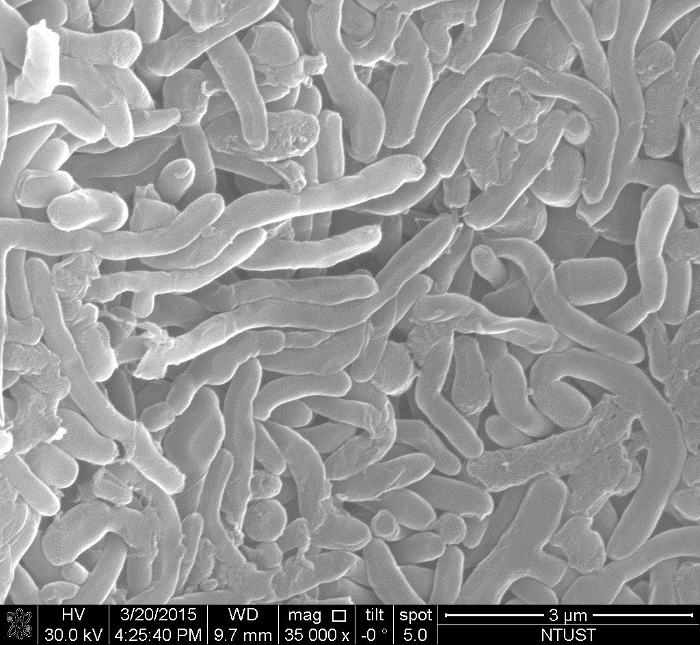 We present a method, the bacterial mineral excretion (BME), for synthesizing two kinds of microcapsules, sodium tungstate and sodium molybdate, and the two metal oxides' corresponding nanoparticles—the former being as small as 22 nm and the latter 15 nm. We fed two strains of bacteria, Shewanella algae and Pandoraea sp., with various concentrations of tungstate or molybdate ions. The concentrations of tungstate and molybdate were adjusted to make microcapsules of different length-to-diameter ratios. We found that the higher the concentration the smaller the nanoparticles were. The nanoparticles came in with three length-to-diameter ratios: 10:1, 3:1 and 1:1, which were achieved by feeding the bacteria respectively with a low concentration, a medium concentration, and a high concentration. 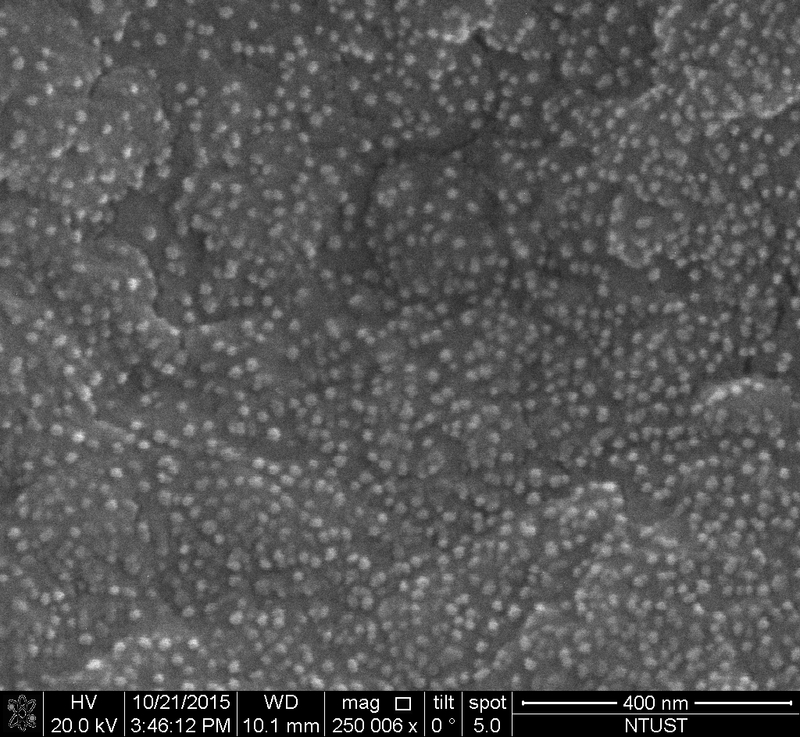 The images of the hollow microcapsules were taken via the scanning electron microsphere (SEM). Their crystal structures were verified by X-ray diffraction (XRD)—the crystal structure of molybdate microcapsules is Na2MoO4 and that of tungstate microcapsules is Na2WO4 with Na2W2O7. These syntheses all were accomplished under a near ambient condition. Metal oxide nanoparticles are exploited for drug delivery1, construction artificial bones2, heterogeneous catalysis3, field emission4,5, solar cells6, gas sensors7, and lithium batteries8. For practical applications, the mechanical strength of both nanocrystals and their microstructure are crucial. Among the microstructures, hollow shell structures can be used to create lightweight, mechanically robust materials9. Among hollow shell structures, a spherical shape is known to be more rigid than an ellipsoidal shape; the latter has a larger length-to-diameter ratio than the former10,11. This work describes a protocol for synthesizing spherical microcapsules via bacteria with a non-toxic method under an ambient condition, which contrasts with the alternative methods, including the template synthesis method12, ultrasonic-spray-assisted synthesis method13 and hydrothermal method14. Some of the alternative methods require templates12, some a temperature as high as 500 °C13, and some a high pressure14. As for the resulting structure, the template synthesis method utilizing the yeast template brings about a core-shell structure15, instead of one with a single wall, and the one utilizing the E. coli template produces a structure with length-to-diameter ratio of 1.7:0.8, and is not spherical.16. 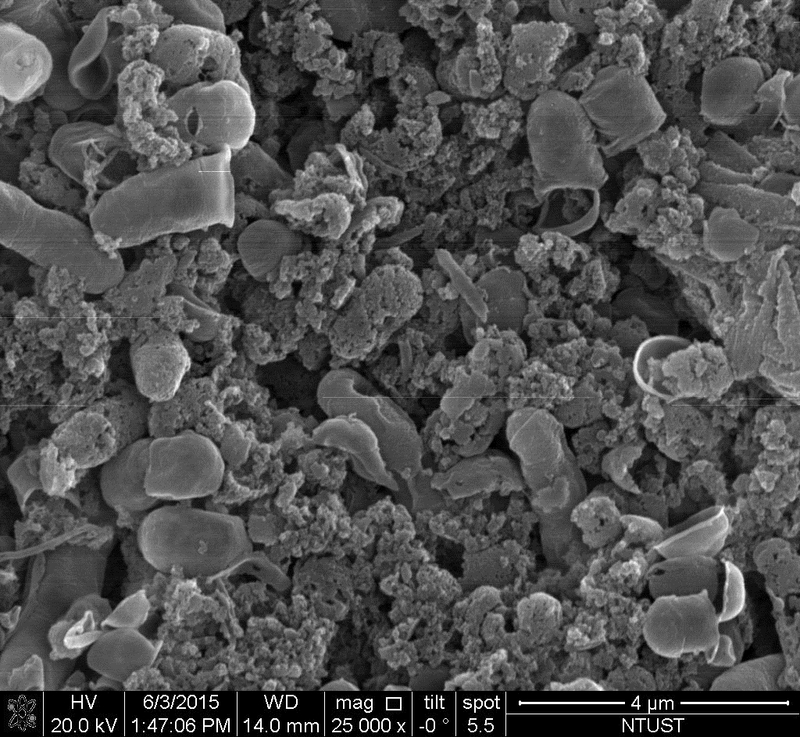 In this work, we have made metal oxide microcapsules with a single wall and of spherical shape under an ambient condition by exploiting bacterial metabolism. In bacterial glycolysis, a chemical process that metabolizes carbon sources, like glucose and lactose, carbon sources are considered to be the origin of the reducing power generated therein. We manipulated bacterial metabolism by adjusting the concentration of carbon sources to achieve desired ends. This method is environment-friendly, using non-toxic agents and consuming much less electricity power. Lastly, this method allows the mass production of microcapsules simply by increasing the volume of broth. Prior to the method, there have been another two methods utilizing bacterial metabolism to make minerals: biologically induced mineralization (BIM)17 and biologically controlled mineralization (BCM)18. Neither BIM nor BCM can be used for making sodium tungstate and molybdate tungstate microcapsules like our process, which is designated as the bacterial mineral excretion (BME)19. In this experiment, the shape of microcapsules can be controlled to have a length-to-diameter ratio from 10:1 to 1:1, and the size of nanoparticle grains that form the shells can be adjusted ranging from 15 nm to 110 nm. Caution: Use latex gloves, protective eyeglasses, and a laboratory coat for performing the experiment. Whenever using the biosafety cabinet, turn on the cabinet fan and keep the cabinet door half-closed. Place 100 glass beads of 3 mm diameter in a 100-mL laboratory bottle, and then cap it tightly. Autoclave the contents at 120 °C for 10 min. Leave the bottle to cool down to room temperature, then place it in the biosafety cabinet. Dissolve 8 g powder of LB-Lennox broth in a 500-mL laboratory bottle with 400 mL of water. Stir the contents with a PTFE magnetic stirring bar for 20 min, and then cap it tightly. Leave the solution to cool down to room temperature and place it in the biosafety cabinet. Using a pipette, aliquot the broth into eight 15-mL centrifuge tubes in the biosafety cabinet (12.5 mL each). Aliquot the remaining broth into three 100-mL laboratory bottles in the biosafety cabinet (100 mL each). Cap the three bottles tightly. Keep them in the biosafety cabinet. Use the deep-frozen cryopreserved strain. In the biosafety cabinet, pick out 1 mL of the frozen material from the frozen tube with a stainless-steel spatula, and place it into a centrifuge tube prepared in step 3.5. Incubate the cultures for 24 h in a 37 °C incubator. Dissolve two tablets of LB-Lennox (broth with agar) into a 100-mL laboratory bottle with 100 mL of water. Stir the contents with a PTFE magnetic stirring bar for 20 min and then cap it tightly. In the biosafety cabinet, aliquot by hand 100 mL of solution into 4 Petri dishes, ensuring each receive ~25 mL. Leave the solution to cool down to room temperature. In the biosafety cabinet, label the three bottles prepared in step 2.6, #1, #2 and #3, respectively. Pipette 0.1 mL of the resultant bacterial suspension in step 3.3 into bottle #1. Cap the bottle and swing it by hand for 1 min to get a homogenous solution. Pipette 0.1 mL of the resultant bacterial liquid in step 5.2 into bottle #2. Cap the bottle and swing it by hand for 1 min to get a homogenous solution. Pipette 0.1 mL of the resultant bacterial liquid in step 5.3 into bottle #3. Cap the bottle and shake it by hand for 1 min to get a homogenous solution. Pipette the liquid in bottle #3 into the 4 Petri dishes prepared in step 4.4, using a volume of 0.02 mL each. Put the glass beads prepared in step 1.3 into the 4 Petri dishes used, 4 beads in each dish. Close the lids of the Petri dishes and shake them by hand for 1 min. Turn the Petri dishes upside down and incubate in a 37 °C incubator for 24 h.
Fetch 7 tubes prepared in step 2.5. Pick out the resultant monoclonal bacteria from the 4 Petri dishes prepared in step 5.8 with a stainless steel-spatula, and put them into 7 tubes separately. Leave the 7 tubes in a 37 °C incubator for 24 h.
Pick out the one with the largest light scattering using the visual colorimetric method. Put 10 g of LB-Lennox broth, 10 g of NaCl, and 10 g of glucose into a 500-mL laboratory bottle. Add water until the volume reaches 450 mL. Stir the contents with a PTFE magnetic stirring bar for 20 min. Put 16.5 g of Sodium Tungstate Na2WO4．2H2O into a 100-mL laboratory bottle with a stainless-steel spatula. Add water until the volume reaches 50 mL. In the biosafety cabinet, get filtrate via a vacuum fiberglass filter with pores of 1 µm. In the biosafety cabinet, pour the filtrate gained in step 8.4 by hand into the solution with glucose and salt prepared in step 7.3. In the biosafety cabinet, aliquot with a pipette the 500 mL resultant solution in step 9.1 into 10 x 50 mL centrifuge tubes. In the biosafety cabinet, fetch the liquid prepared in step 6.4 and aliquot it with a pipette into the 10 test tubes prepared in step 9.2, with each tube receiving 0.05 mL. Incubate the 10 tubes in a 37 °C incubator for 120 h.
Ultrasonicate each of the 10 tubes in step 9.2 at 20 KHz with 150 W for 1 h.
Centrifuge the tubes at 2,025 x g for 1 h.
Remove the clear liquid in the tubes with a pipette, add water, and then repeat steps 11.1 and 11.2 one more time. Remove the clear liquid in the tubes with a pipette, add alcohol, and then ultrasonicate them at 20 KHz with 150 W for 1 h.
Harvest BME minerals by removing the clear liquid in the tubes with a pipette; afterwards, immediately cap the tubes without running any drying process. Culture Pandoraea sp. in the same way as in steps 2, 3, 4, 5, and 6 for Shewanella algae. The result of this step corresponds to that of step 6.4. Make LB broth with both glucose and salt in the same way as in steps 7, 8, and 9, except that the 16.5 g of sodium tungstate in step 7.1 is replaced with 12 g of sodium molybdate, Na2MoO4 · 2H2O. The result of this step corresponds to that of step 9.2. In the biosafety cabinet, fetch the liquid prepared in step 12.1, and aliquot it with a pipette into the 10 tubes prepared in step 12.2, with each tube receiving 0.05 mL. Incubate the 10 tubes in step 12.3 under oscillating temperatures for 120 h in a reciprocal shaking bath, oscillating the temperature 5 times between 25 °C and 37 °C, with each temperature lasting for 12 h.
Figure 1 shows genuine spherical microcapsules. Both the two strains of bacterium, Shewanella algae and Pandoraea sp., originally have a length-to-diameter ratio of 3:1. For achieving the length-to-diameter ratio of 1:1, a high concentration (>100 mM) of metal oxyanions is required. A low concentration (<5 mM) of oxyanions can result in a length to diameter ratio of 10:1, as that in Figure 2, which may result from the influx of the oxyanions, blocking the binary fission of bacteria. Lastly, for achieving a length-to-diameter ratio of 3:1, like that in Figure 3, a medium concentration (~20 mM) of oxyanions is needed. The formation of spherical shells, with a length-to-diameter ratio of 1:1, may be brought about by bacterial drives that make themselves shrink their surface area to balance the intake of oxyanions while diffusing oxyanions through the cell membrane. The three figures together indicate the length-to-diameter ratio may be tuned to from 10:1 to 1:1 simply by adjusting the concentration of oxyanions. Figure 4 and Figure 5 show the nanoparticle grains of sodium molybdate in different sizes: the smaller one being 15 nm, and the larger one 110 nm. Note that in Figure 5, on the non-shattered shells, particles of 110 nm can still be chained up to each other, forming porous shells. The larger one was gained through oscillating the temperature of the culturing broth 5 times between 25 °C and 37 °C, with each temperature lasting for 12 h. During the temperature oscillation, grains of different sizes can not only be produced but also maintain the micro-spherical structure, which means we can make microcapsules with different grain sizes, from 15 nm to 110 nm, just by controlling the broth temperature. Figure 6 shows the broken wall with larger grains staying next to the opening of the wall. The wall thickness is about 22 nm and the larger grain is about 40-60 nm. The difference in size may result from different metabolic processes, which are not yet identified. Figure 1: The SEM image of hollow spherical shells with a length-to-diameter ratio of 1:1. This structure was made of sodium tungstate excreted by Shewanella algae with glucose as the carbon source. Reprinted with permission from ECS J. of Solid State Sci. and Tech., 6(3), N3113 (2017). Copyright 2017, The Electrochemical Society. Please click here to view a larger version of this figure. Figure 2: The SEM image of hollow long filament shells with a length-to-diameter ratio of 10:1. This structure was made of sodium molybdate excreted by Pandoraea sp. with glucose as the carbon source. Reprinted with permission from ECS J. of Solid State Sci. and Tech., 6(3), N3113 (2017). Copyright 2017, The Electrochemical Society. Please click here to view a larger version of this figure. Figure 3: The SEM image of broken hollow rod-shaped shells with a length-to-diameter ratio of 3:1. This structure was made of sodium tungstate excreted by Shewanella algae with glucose as the carbon source. Reprinted with permission from ECS J. of Solid State Sci. and Tech., 6(3), N3113 (2017). Copyright 2017, The Electrochemical Society. Please click here to view a larger version of this figure. Figure 4: The SEM image of shattered sodium molybdate shells with a grain particle size of 15 nm. Please click here to view a larger version of this figure. Figure 5: The SEM image of shattered and non-shattered sodium molybdate shells with a grain particle size of 110 nm. Please click here to view a larger version of this figure. Figure 6: The SEM image of broken hollow shells with a length-to-diameter ratio of 1:1. This structure was made of sodium tungstate excreted by Shewanella algae with glucose as the carbon source. Granules with a size about 40-60 nm hang outside the shell right next to a big hole, while the shell itself is made of granules with a size about 22 nm. Reprinted with permission from ECS J. of Solid State Sci. and Tech., 6(3), N3113 (2017). Copyright 2017, The Electrochemical Society. Please click here to view a larger version of this figure. Concerning the self-consistency of the experimental results, the preparation and multiplication of monoclonal bacteria are critical. This experiment, different from the template synthesis experiments15,16, employed bioactive gram-negative bacteria. To get a single wall, we chose prokaryotic bacteria instead of eukaryotic bacteria like yeast15. To achieve a spherical shape with a length-to-diameter ratio of 1:1, instead of a larger length-to-diameter ratio16, we fed bacteria with a much higher concentration of oxyanions to manipulate them to shrink into a spherical shape, making microcapsules with a single, round, and thin wall (<30 nm). Since the BME mainly relies on adjusting the concentration of oxyanions to control the metabolism of bacteria, it features two limitations. Firstly, the concentration of oxyanions is limited by the solubility, though the concentration should be as high as possible. Second, most bacterial metabolisms will stop at a temperature over 45 °C or under 5 °C, respectively the upper and lower bounds of our experiment. Despite these two limitations, the BME has great potential for making metal oxide materials of practical interest. To substantiate this claim, we are going to try this method to make zirconium microcapsules and iron microcapsules—the former being a good candidate material for artificial bones, and the latter for drug delivery. This work is supported by Ministry of Science and Technology, Taiwan, Republic of China, under grant number MOST 105-2221-E-011-008, and also by Advanced-Connectek Inc., Taipei, Taiwan, ROC under contract number RD Ref. No. 6749 and Dept. Ref. No. 011 through the Graduated Institute of Electro-Optical Engineering, National Taiwan University of Science and technology. Chertok, B., Moffat, B. A., David, A. E., Yu, F., Bergemann, C., Ross, B. D., Yang, V. Iron Oxide Nanoparticles as a Drug Delivery Vehicle for MRI Monitored Magnetic Targeting of Brain Tumors. Biomaterials. 29, (4), 487 (2008). 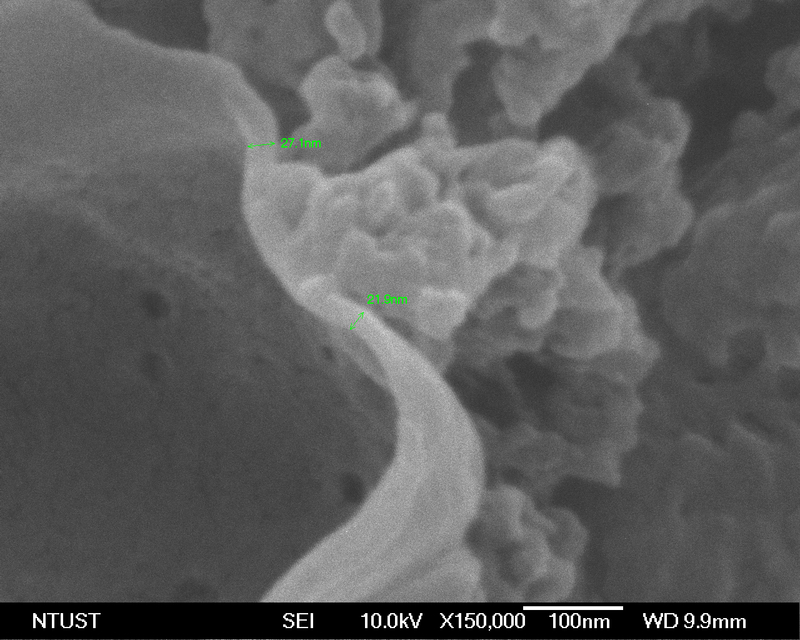 Mansur, C., Pope, M., Pascucci, M. R., Shivkumar, S. Zirconia-Calcium Phosphate Composites for Bone Replacement. Ceramics Int. 24, 11 (1998). Wang, Y., Arandiyan, H., Jason Scott, J., Bagheri, A., Dai, H., Amal, R. Recent advances in ordered meso/macroporousmetal oxides for heterogeneous catalysis: a review. J. Mater. Chem. A. 5, 8825 (2017). Kleshch, V. I., Rackauskas, S., Nasibulin, A. G., Kauppinen, E. I., Obraztsova, E. D., Obraztsov, A. N. Field Emission Properties of Metal Oxide Nanowires. J. of Nanoelectron. and Optoelectron. 7, 35 (2012). Ismagilov, R. R., Tuyakova, F. T., Kleshch, V. I., Obraztsova, E. A., Obraztsov, A. N. CVD nanographite films covered by ALD metal oxides: structural and field emission properties. Phys. Status Solidi C. 12, (7), 1022 (2015). Mor, G. K., Shankar, K., Paulose, M., Varghese, O. K., Grimes, C. A. Use of Highly-Ordered TiO2 Nanotube Arrays in Dye-Sensitized Solar Cells. NANO LETT. 6, (2), 215-218 (2006). Lee, J. -H. Gas sensors using hierarchical and hollow oxide nanostructures: Overview. Sensors and Actuators B. 140, 319 (2009). Poizot, P., Laruelle, S., Grugeon, S., Dupont, L., Tarascon Shankar, J. 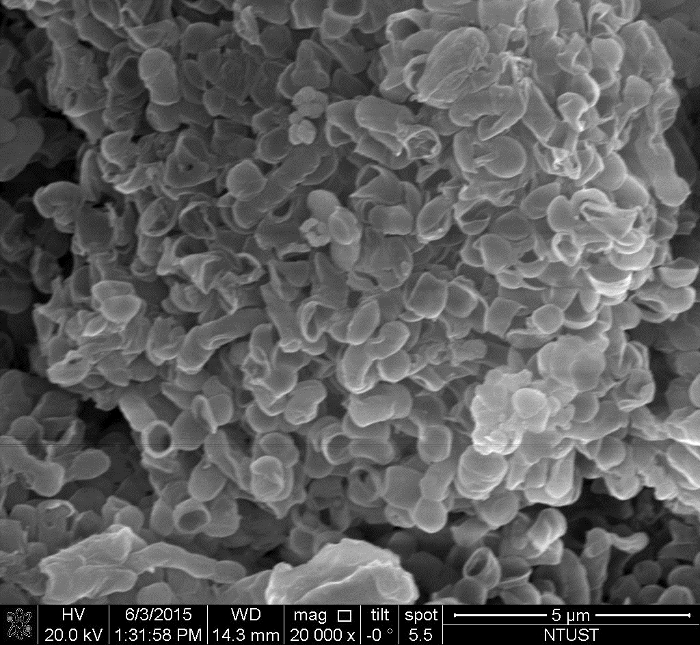 -M. Nano-sized transition-metal oxides as negative-electrode materials for lithium-ion batteries. Nature. 407, 496 (2000). Jang, D., Meza, L. R., Greer, F., Greer, J. R. Fabrication and deformation of three-dimensional hollow ceramic nanostructures. Nature Materials. 12, 893 (2013). Lazarus, A., Florijn, H. C. B., Reis, P. M. Geometry-Induced Rigidity in Nonspherical Pressurized Elastic Shells. PRL. 109, 144301 (2012). Vella, D., Ajdari, A., Vaziri, A., Boudaoud, A. Indentation of Ellipsoidal and Cylindrical Elastic Shells. PRL. 109, 144302 (2012). Xu, H., Wang, W. Template Synthesis of Multishelled Cu2O Hollow Spheres with a Single-Crystalline Shell Wall. Angew. Chem. Int. Ed. 46, 1489 (2007). 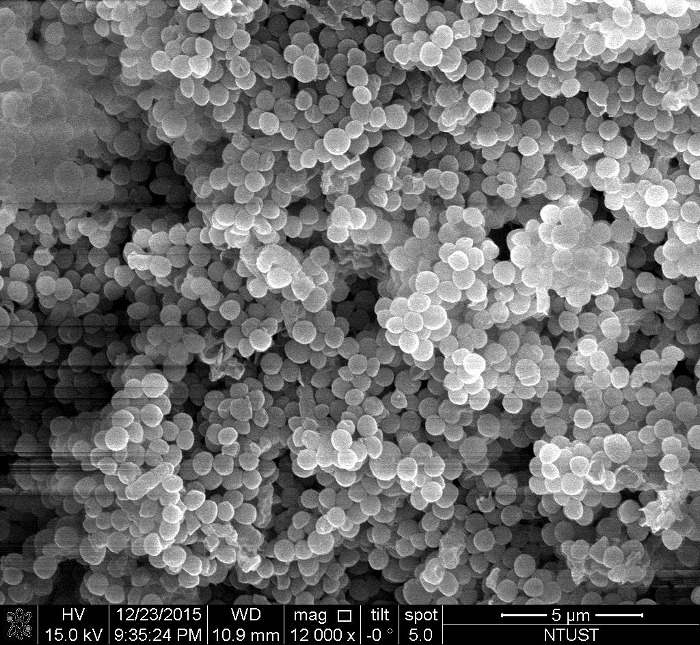 Li, B., Shao, X., Hao, Y., Zhao, Y. Ultrasonic-spray-assisted synthesis of metal oxide hollow/mesoporous microspheres for catalytic CO oxidations. RSC Adv. 5, 85640 (2015). Yu, J., Wang, G. Hydrothermal Synthesis and Photocatalytic Activity of Mesoporous Titania Hollow Microspheres. Powder Tech. 301, 96 (2016). Xu, G., Zhang, X., Cui, H., Zhang, Z., Ding, J., Wu, J. Facile synthesis of mesoporous SnO2 microspheres using bioactive yeast cell. Powder Tech. 301, 96 (2016). Nomura, T., Tanii, S., Ishikawa, M., Tokumoto, H., Konishi, Y. Synthesis of hollow zirconia particles using wet bacterial templates. Adv. Powder Tech. 24, 1013 (2013). Frankel, R. B., Bazylinski, D. A. Biologically Induced Mineralization by Bacteria. Rev. in Mineralogy and Geochem. 54, (1), 95 (2003). Bazylinski, D. A., Frankel, R. B. Biologically Controlled Mineralization in Prokaryotes. Rev. in Mineralogy and Geochem. 54, (1), 217 (2003). Lin, P. -H., Huang, Y. -T., Lin, F. -W. Sodium Tungstate and Sodium Molybdate Hollow Microspheres Biologically Controlled Mineralization in Prokaryotes. ECS J. of Solid State Sci. and Tech. 6, (3), N3113 (2017).